"I have tons of important information saved in notes on my iPhone running iOS 11. I do want to backup the notes to computer so that I can review them at any time or print them for further use. But I have no clue. I don't want to use iTunes, because it does't allow me to view the backup. iCloud is not a good choice for me either for I don't have enought space on iCloud for these notes.Can anyone help me out?" Recently, we came across this question in an Apple forum but the replies were not satisfactory. So, we have undertaken the task to answer it comprehensively. 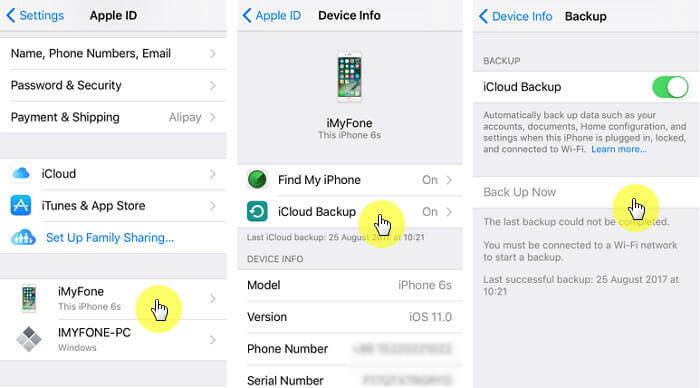 In this article, we are going to show you 4 different ways to back up notes on your iPhone. If you have the same question, you will find a suitable solution here. 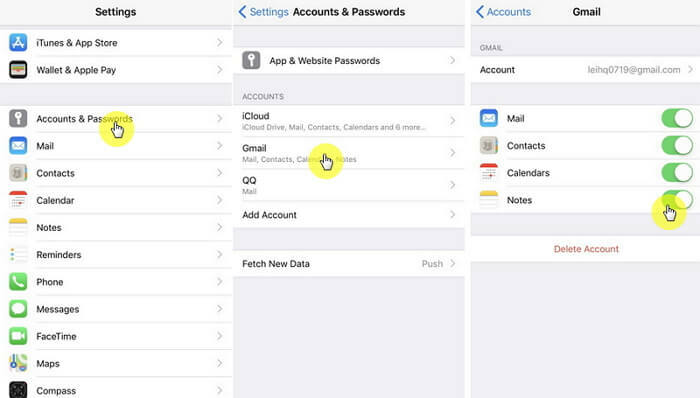 Go to Settings >> Accounts & Passwords >> Gmail, switch on the Notes option if it is off, and tap on Save, then you iPhone will start syncing notes from your iPhone to your Gmail account. The same method also applies to iPad. But if your iPhone or iPad is older than iOS 12/11, the Gmail option is not under Accounts & Passwords, but on the Mail option. The notes are saved on Gmail and you will need to sign in to access them. An internet connection will also be needed when you want to access the Notes. 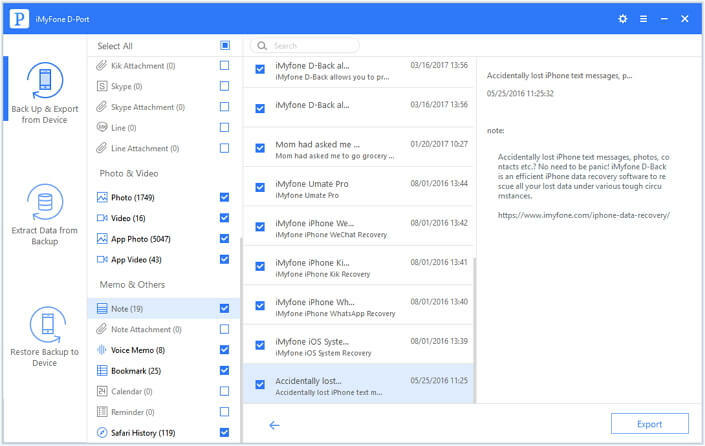 iCloud automatically creates backup of iPhone data including your notes. For iCloud, open Settings on iPhone and go to iCloud. Turn on the Notes option if it is disabled. 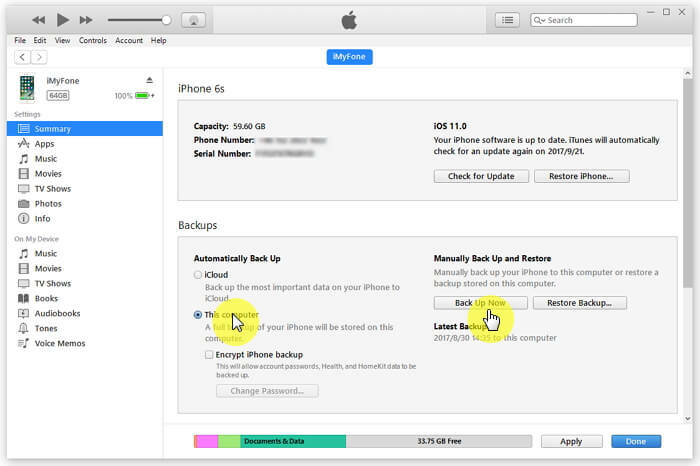 Then navigate to Backup to activate iCloud backup. Please make sure the storage space on your iCloud is enough for the notes. If it is not sufficient, your need purchase it from Apple. It is also possible to do the same using iTunes on your computer. To back up notes on your Mac or PC using iTunes, connect your iPhone and open iTunes Summary tab. Then click on the checkbox of "This computer" option, and click on the Back Up Now button to make a full backup of your iPhone on the computer. It takes lot of time to create backups. You will not be able to read and access iTunes backup directly. 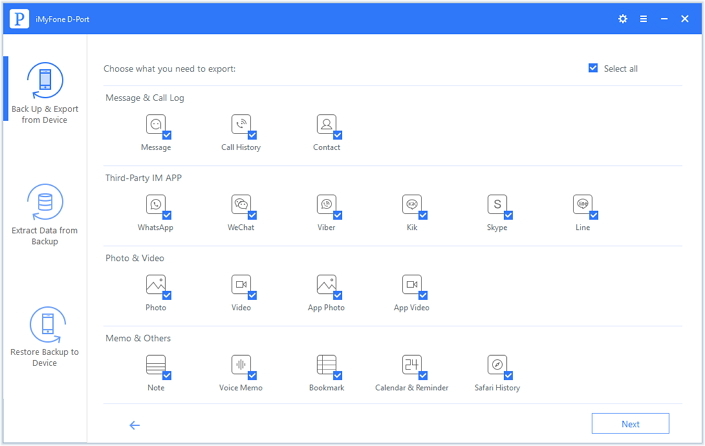 Supports to selectively extract 18+ types of data from iTunes/iCloud backup or your iOS devices, not just notes but also many other types of date, for example photos, messages, WeChat history, WhatsApp history and more. 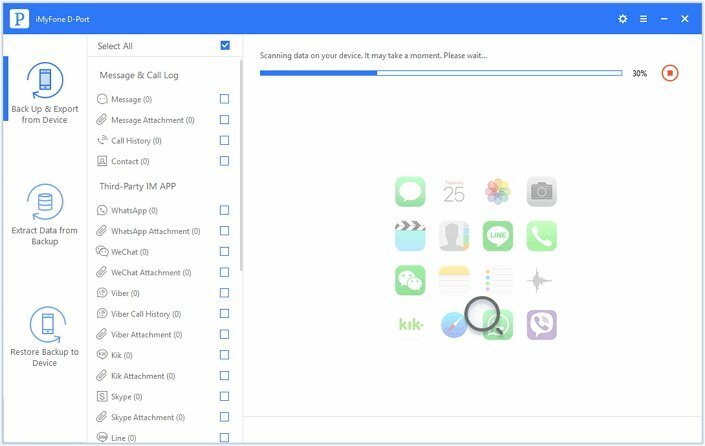 Supports to selectively backup your iOS devices, which means you can backup only partial data such as messages, WhatsApp messages, WeChat messages, or completely backup the data on your computer. Compatible with all iOS devices like iPhone 8/iPhone X and all iOS versions including iOS 12/11. The process is quite simple and you can do all of it really easily. Step 1: Install the program and open it. Click on "Back Up & Export from Device" option. Connect your iPhone with the computer using the USB cable. Then select the green "Export Data" button. Step 2: Now from the file types select "Notes" under "Memo & others" section and click on "Next." After that, the program will scan your iPhone. Step 3: When the scan is complete you will be given a chance to preview the notes. This way you get to backup only the required notes discarding the others. Choose the notes you want to back up to computer and click on "Export" at the lower right part of the window. Select a destination on the Mac or PC to save the backup and you are done! 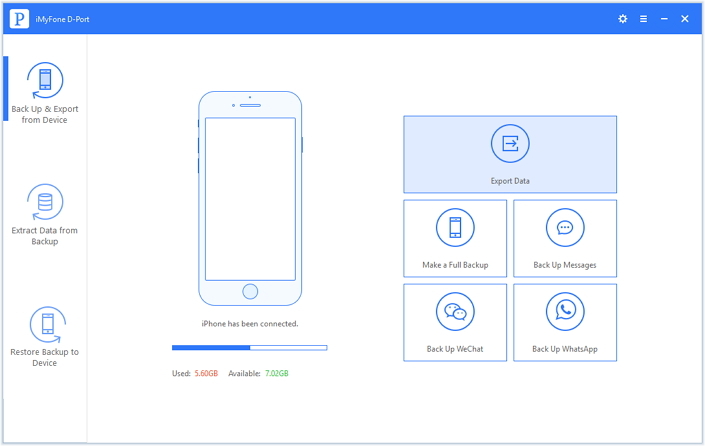 Now you can download the free trial of iMyFone D-Port iPhone Data Exporter to backup your notes from iPhone X/8/7/6s/6/5s/5c/5/4s/4 running all iOS versions including iOS 12/11 on your computer. Now, you can choose the best solution according to your own situation. If you have any other solution, please leave a comment below. That will help lots of people. We really appreciate that.